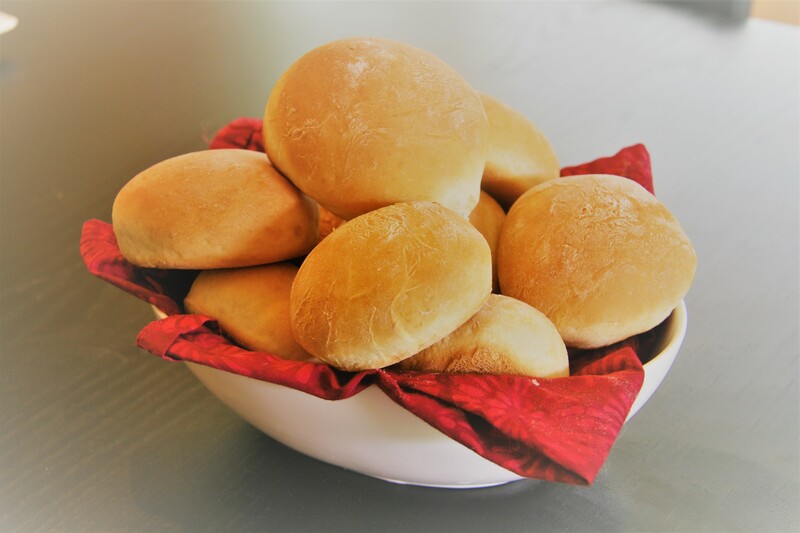 Soft Buns - Wholly Delish! It’s BBQ season and while we don’t eat a lot of meat, we do still enjoy burgers. This is especially true on a summer evening at the end of an afternoon playing outside and splashing in the pool. Yesterday was a holiday here and all the stores we closed, so if we wanted burgers I had no choice but to make my own buns. This is something I’ve done many times before, so it wasn’t a big deal. I simply whipped up a batch of these easy, quick (freshly baked yet ready in just 1hr!) and satisfyingly soft buns. These are so versatile – great at thanksgiving along side roast and gravy, great for lunchtime sandwiches and great for burger buns! In order to achieve the soft texture with a limited rise time, this recipe uses bread flour and a smaller than usual (for me) ratio of whole wheat flour. Feel free to use 50/50 but that will result in a denser, less soft bun. I mix these in my stand mixer (I’ll never stop appreciating my husband for investing in one for Xmas years ago!) But you can also mix with a spoon and knead by hand. Give them a try for your next burger! Add water and yeast to the bowl of a stand mixer with dough hook attachment (or large mixing bowl) and let stand until frothy (3-5 min). Add sugar, salt and melted butter begin mixing on low speed (2 on KitchenAid). Add flour 1 cup at a time until combined (dough will be sticky). Knead for 3 minutes (5-6 min by hand using flour sparingly to keep from sticking to hands or counter). Roll into small balls according to the size you’d like (I made 16 for small slider-like burgers) and place in greased (or parchment lined) baking sheet. Let buns rise until 1.5x in size (approx 30 min). Bake at 375 degrees for approximately 15 min until golden brown. One Response to "Soft Buns"